I’m still trying to figure out which kids will share a room together. Stella and Lucas. Or Lucas and Jackson. 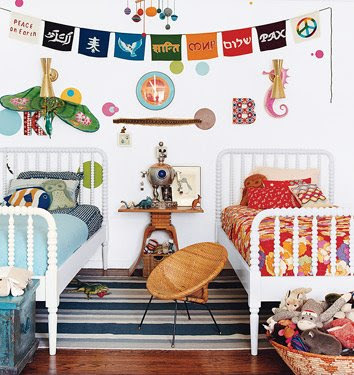 Keep the room all boy or have a gender-neutral room. And I’m in the market to find a big-boy bed for Lucas. With that said, I’m looking for either a trundle bed or a bunk bed because before I know it Jackson will need a bed. Might as well get it now instead of later. Anyway, I really like Sunrise Ruffalo‘s gender-neutral room that her daughter and son share. Ooh, I like that. Stick them together until Stella starts Kindergarten, then put the boys together! Or is that too much work? We play musical rooms all the time around here. Nathanael went straight from his co-sleeper to a twin bed that can later have a trundule for those later years of sleep- overs. With him I bought the whole pottery barn set dresser, bed, etc….and I picked something he could later take with him when he gets old enough ; ). That’s a great room! I’m sure you’ll come up with something completly brillianT!